Norwalk, CT - Norwalk Community Health Center, Inc. (NCHC) and premier sponsor Fairfield County Bank invite everyone to put their best foot forward to raise awareness and funds to prevent childhood obesity in Fairfield County. The non-profit healthcare provider’s inaugural Ready Set Walk and Keep Moving event starts at 9 AM, Sunday, September 23 at Calf Pasture Beach in Norwalk. Besides the main event, a 3k fun walk, participants are invited to stay and ‘keep moving’ with Zumba, yoga, Frisbee, hula hooping, and jump rope. The morning also features NCHC’s 2nd annual Invitation Volleyball Showdown. NCHC ‘All Stars’ challenge teams of elected officials, Norwalk Chamber member, the media, NCHC patients, and NCHC’s Norwalk Hospital clinical residency program for 2018 bragging rights. Ready Set Walk registration includes all activities. NCHC provides quality comprehensive health care (adult, pediatric, women’s, behavioral and adult and pediatric dental health) to nearly 14,000 unique patients each year. It relies on patient fees, grants, proceeds from events such as Ready, Set Walk, and contributions to carry out its mission and respond to evolving community needs. 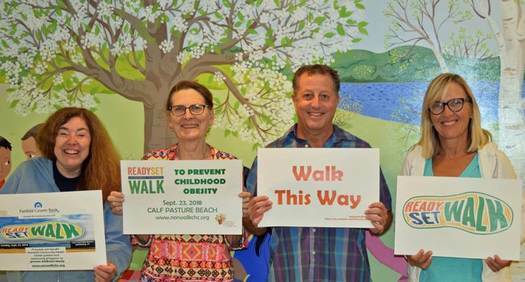 Learn more about Ready Set Walk and NCHC at www.norwalkchc.org or https://nchc.salsalabs.org/2018readysetwalk.